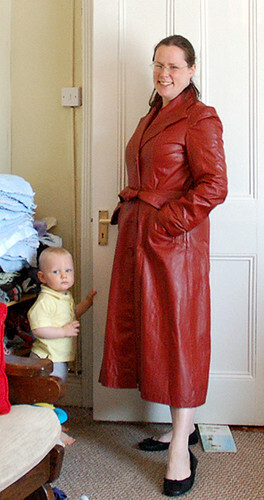 So I went back to the vintage shop to get the red leather coat for my friend E. I tried it on again at the shop, because she’d been concerned about the tightness of the arms, and I thought “Huh, not quite as tight as I’d thought, guess I mis-remembered, it’ll be great for E!” And I bought it. When I got home I thought “I’ll exhale to the bottom of my soul so I can get the thing buttoned up and get a picture of it, anyway, because it’s a great coat!” And I untied the belt I hadn’t noticed at the back, and put it on, and, er, it fit perfectly. Apparently the belt had been tied *quite* tightly on Monday, and I simply hadn’t noticed it, and anyway, now the coat is too big for E but it fits me beautifully, so, um. Coat! *giggles* That is an awesome coat! I love the lurker in the corner, too. Actually I was sort of embarrassed, really! :P Of course not. The story--and that you got a lovely coat out of the deal--is better than anything else you could get me. I mean, really--who on earth decides to buy a leather coat, sight-unseen, from an entirely different hemisphere? I mentioned to Greg, "well, if it doesn't fit me, I'll find someone!" It's not like I even have anywhere to wear it, either. That is a very cool coat. Fabulous coat! And one of those things that was just Meant To Be. Be careful. If you keep readjusting reality like that, it's eventually going to snap back and bite you.